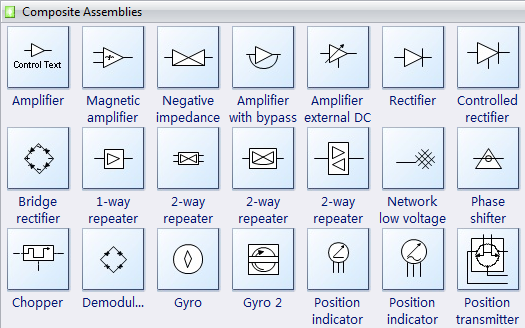 The following Composite Assembly symbols, showing some standard electrical symbols for electrical schematics such as amplifier, magnetic amplifier, amplifier, rectifier, shifter, repeater, network low voltage, gyro, indicator, etc. Every composite symbol can be configured by the action button. In our System Diagram Software, you can use the action button to choose the right electrical symbol with one click.